I will pay one American dollar for this scene to be in the next Green Lantern movie. Should another one get made within the next few decades, of course. “Am I the germ of this chaos?” is my new catch phrase. Emerald Dawn II is an awesome book. Gerard Jones is tragically overlooked. Hah, and Englehart didn’t write this? ‘Cause that’s totally an Englehart move. 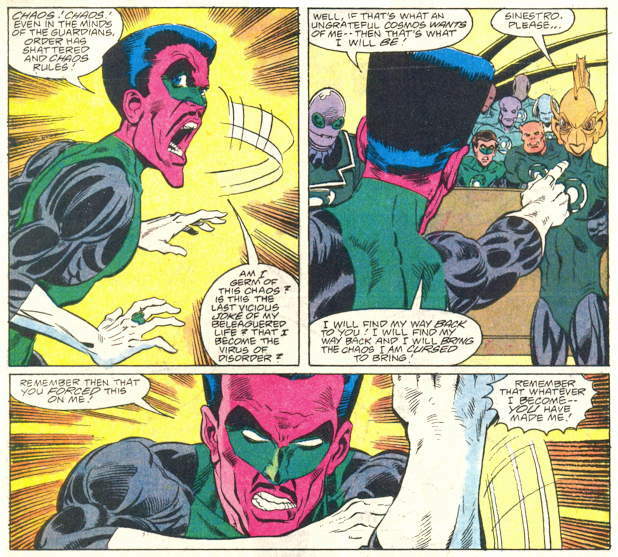 Although Sinestro should have done it with his ring hand, to illustrate the point better. @Old Bull Lee–agreed on Jones. Martian Manhunter: American Secrets is one on my favorite mini-series. bras d’honneur. ugh. You learn something new every ‘progressive ruin’ day. Seems like a Guy Gardner thing to do. M.D. Bright does not draw nearly enough comics these days.